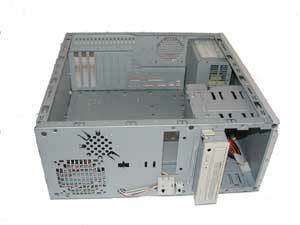 Introduction of a MidiTower case of quality design made by the Soltech company. Case without the side cover with removed front plastic cover. Side Open Covers - Cheap cases do not have 2 side covers, they only have one whole cover. The version with 2 covers makes the access to the MB and the interior much easier and so it simplifies handling and possible troubleshooting (usually removing of one cover is enough). 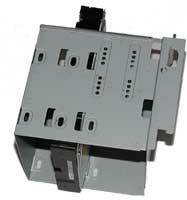 Removable 3,5" drive Bracket - ensures easier installation, assembly and removal of the 3,5" drives (HDD a FDD). 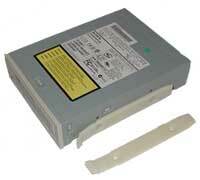 Slide-in CDROM Rails - somewhat untraditional fixing of the 5,25" drives by help of rails. 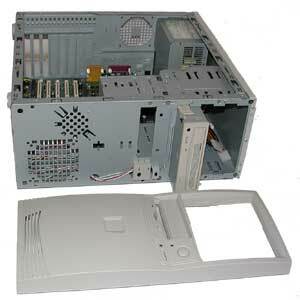 The plastic rails must be screwed on the drive and the front cover of the case must be removed. Then, you just slide the drive in. To uninstall it you just press the front part of the rails and slide it out. The optimal source´s position and greater unusual height mean much space. Thanks the source and two gratings for additional fans you will get great cooling also for very powerful computers. Marked connectors - All the connectors are clearly marked, so they are also suitable for less experienced users. A lot of producers leave the Power SW and the Speaker without any label (the speaker is easy to be recognized, in case of the Power button you have to use the trial and error method). One step to perfection. There is some space c. 5mm between the motherboard and the 5,25" drive (CD-ROM) - practically, it could bring some problems with placing the last drive. 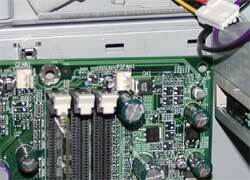 E. g. in the FIC AZ11EA MB the drive can only be placed by help of slight bending of the MB´s edge. Placing of the drive into the MSI KT266 MB is not possible because of tall electronic parts; placing of the mobile rack that is longer than CD-ROM is also difficult - the slots for DIMM memories are obstructing (also in AZ11EA). Standard endings for connection of diodes and buttons. Source - 250W (optimal performance for recent powerful PCs). Plus - Quality design. 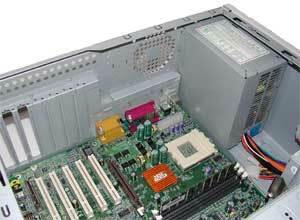 Powerful source with suitable position over the MB. 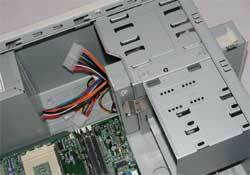 Good cooling, removable disk board, easy and quick sliding-in of 5,25" drives. Minus - Just a bit to perfection. 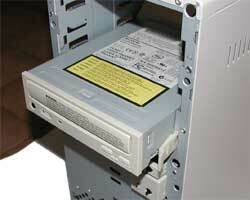 Possible problems with placing the drive into the undermost 5,25" position. Non-removable board for placing the MB (removal board you will rarely find in most of the miditowers and common users do not value it).